مار زهرافکن (که در انگلیسی به نام‌های Gaboon viper, butterfly adder، forest puff adder، swampjack، معروف است) نوعی مار است که خطرناک‌ترین زهرها را در میان دیگر مارهای زهردار دارد. دندان‌های نیش این افعی‌ها بزرگ‌ترین دندان نیش بین تمام مارهاست. این مارها می‌توانند با هر بار حمله سم مورد نیاز برای کشتن سی نفر را تزریق کنند. ↑ McDiarmid RW, Campbell JA, Touré T. ۱۹۹۹. Snake Species of the World: A Taxonomic and Geographic Reference, vol. 1. Herpetologists' League. ۵۱۱ pp. ISBN 1-893777-00-6 (series). ISBN 1-893777-01-4 (volume). ↑ ۲٫۰ ۲٫۱ ۲٫۲ Mallow D, Ludwig D, Nilson G. 2003. True Vipers: Natural History and Toxinology of Old World Vipers. Krieger Publishing Company, Malabar, Florida. 359 pp. ISBN 0-89464-877-2. Bowler JK. 1975. Longevity of reptiles and amphibians in N. American collections as of 1 November, 1975. Society for the Study of Amphibians and Reptiles, Miscellaneous Publications, Herpetological Circular 6:1–32. Brown JH. 1973. Toxicology and Pharmacology of Venoms from Poisonous Snakes. Published by Charles C. Thomas. Forbes CD, Turpie AGG, Ferguson JC, McNicol GP, Douglas AS. 1969. 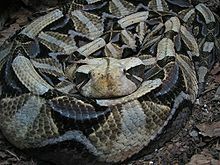 Effect of gaboon viper (Bitis gabonica) venom on blood coagulation, platelets, and the fibrinolytic enzyme system. Journal of Clinical Pathology 22:312–316. Lenk P, Herrmann H-W, Joger U, Wink M. 1999. Phylogeny and taxonomic subdivision of Bitis (Reptilia: Viperidae) based on molecular evidence. Kaupia, 8:31–38. Marsh NE, Whaler BC. 1984. The Gaboon viper (Bitis gabonica) its biology, venom components and toxinology. Toxicon 22(5):669–94. در ویکی‌انبار پرونده‌هایی دربارهٔ مار زهرافکن موجود است. Bitis gabonica at the Reptarium.cz Reptile Database. Accessed 2 August ۲۰۰۷. Keeping Gaboon Vipers at VenomousReptiles.org. Accessed ۲ اوت ۲۰۰۷. Video of B. g. gabonica and B. arietans در یوتیوب. Accessed ۹ دسامبر ۲۰۰۶. Video of B. g. gabonica feeding در یوتیوب. Accessed ۸ اوت ۲۰۰۷. B. g. gabonica image at Glades Herp. Accessed ۹ اوت ۲۰۰۷. این صفحه آخرین‌بار در ‏۲۰ اوت ۲۰۱۸ ساعت ‏۱۱:۵۹ ویرایش شده‌است.